Como todos los viernes (aunque a partir de la semana que viene y durante las Navidades revisitaré algunos de mis post previos) os traigo un autor (hoy autora) invitada: Gertrudis Gómez de Avellaneda. Como recordaréis hablamos de ella en el post de Emilia Pardo Bazán, así que me pareció una buena ocasión para traerla de visita. 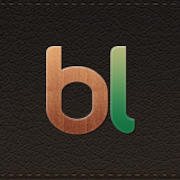 Como siempre os ofrezco una breve biografía (con enlaces para que leáis más si os apetece), unas breves muestras de sus poemas (algunos son demasiados largos para un post), y enlaces sobre su vida y obras (gratis en la Biblioteca Digital Cervantes). 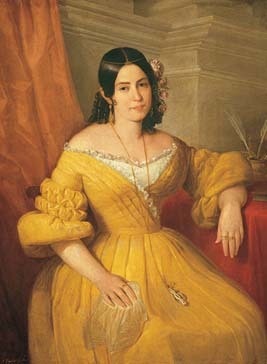 Gertrudis Gómez de Avellaneda nació en Puerto Príncipe (Cuba) el 23 de Marzo de 1814 (aunque en su autobiografía menciona el 1816). Su padre era el capitán de barco Manuel Gómez de Avellaneda, y su madre Felisa de Arteaga. Durante su juventud, y por motivos de salud, se trasladó a Santiago de Cuba, después de negarse a casarse. En Abril de 1836 partió con su familia y después de una estancia en Burdeos se instalaron primero en La Coruña y de allí fueron a Sevilla. En Cádiz empieza a escribir en La Aureola, con el seudónimo de La Peregrina. En 1839 conoce a Ignacio de Cepeda, un estudiante de Leyes del que se enamora apasionadamente, y al que dedicó cartas y su autobiografía. En literatura admiraba a Mme. de Stael, Chateaubriand, Walter Scott, y a Quintana y Lista. Se traslada a Madrid en el 1840, donde publica sus primeros poemas (y los lee en el Liceo). También empieza a escribir teatro y en 1844 se estrena Munio Alfonso, en Madrid. Otra obra destacada es su novela Sab (1841) que fue la primera novela abolicionista (antes que La cabaña del tío Tom). En 1844 conoce al poeta Gabriel García Tassara y establece una relación difícil con él. Queda embarazada, soltera, y en Abril de 1845 tiene a su hija María (ella la llama Brenhilde), que nace enfermiza y muere a los 7 meses. Escribe cartas a Tassara para convencerlo de que vaya a ver a su hija antes de que muera pero él se niega. Ese mismo año obtiene dos primeros premios de la competencia poética del Liceo Artístico y Literario de Madrid y a partir de entonces empieza a ser reconocida. En 1846 se casa con Pedro Sabater (o según otras fuentes Diciembre del 1845). Su marido enferma al poco de casarse y aunque viajaron a París para intentar encontrar una curación, muere en Burdeos. Se recluye en el convento de Nuestra Señora de Loreto donde escribe algunos tratados religiosos, y dos elegías dedicadas a su marido. En 1850 publica la segunda edición de sus poesías. 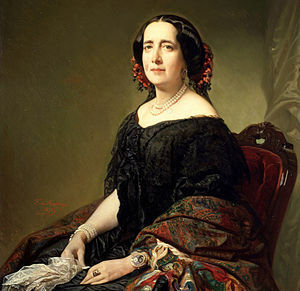 A pesar del apoyo de muchos escritores de la época (Bécquer, Zorrilla, Caballero, Espronceda), cuando se presenta candidata a la Real Academia Española, animada por sus éxitos, en 1854, escogen a un hombre (¡que sorpresa!). En 1856 se casa con don Domingo Verdugo, un político importante, al que hieren durante uno de los estrenos de una de sus obras, y se van a vivir a Cuba en 1859, con la esperanza de que el clima le ayude a recuperarse. Allí la reciben con todos los honores (la llaman afectuosamente Tula), la declaran poetisa nacional. Dirige una revista en Cuba por unos seis meses y vuelve a Madrid en 1863 (después de visitar Nueva York, Londres y París). Su marido muere ese mismo año y Avellaneda se vuelca aún más en la religión y en una vida espartana. Muere en Sevilla el 1 de Febrero de 1873 y está enterrada en el cementerio de San Fernando. Su poesía temprana se ha comparado a la de Elizabeth Barrett Browning por su análisis de los estados de ánimo psicológicos de los enamorados, aunque en sus últimos años se centró más en temas religiosos. Aparte de Sab, publicó otras novelas conocidas, Dos mujeres (contra el matrimonio) y Guatimozín, novela histórica ambientada en el México de la época de la conquista. Su otra obra narrativa es menos conocida. En cuanto a su obra teatral, muchas de sus obras fueron de corte histórico (Leoncia, la ya mencionada Munio Alfonso, el príncipe de Viana y Egilona). Las piezas teatrales con las que obtuvo más fama son de tema religioso: Saúl y Baltasar. También obtuvo bastante éxito una comedia, La hija de las flores. ¡Adiós, patria feliz, edén querido! las olas corta y silencioso vuela. En Amazon hay varias obras suyas en formato electrónico gratis, pero parecen ser la versión de la Biblioteca Cervantes, que está más arriba. Gracias por leer, y si os ha gustado, por favor, darle al me gusta, comentad, compartid y sobre todo, haced CLIC (¡que es gratis!). La semana que viene, especial Navideño, con selección de posts del año. Guest classic author: Beatrix Potter. Children’s books, rabbits and the Lakes. Today as all Fridays (although we’ll take a break to bring you some Christmas specials during the festive period) I bring you a guest author. This time is a classic that I think most of us will be familiar with (and especially with her characters): Beatrix Potter. There is plenty of information about her on the internet. I leave you a short biography and links to more information about her and her works. 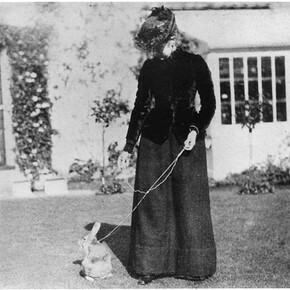 Helen Beatrix Potter was born on the 28th July 1866 in London (South Kensington). Both her grandparents had been industrialists in the cotton business (in the Manchester area) and her parents were quite wealthy and followers of the Unitarian faith. Her father was a barrister and amateur photographer and her mother enjoyed embroidery and drawing. They were both interested in the arts and encouraged Beatrix and her younger brother, Walter Bertram, in the pursuit of their artistic interests. She was educated at home by private governesses, and she and her brother spent time studying, drawing and taking art lessons and observing and playing with their pet animals. The best know of her governesses, Annie Moore, taught her German and was only 3 years older than her, becoming also her companion. They corresponded throughout the years and Beatrix sent her children (particularly Noel, who was often ill as a child) illustrated letters and tales to keep them entertained. Many of these letters would later become some of her best known children’s books. Her family used to go on holidays to the countryside, often visiting Scotland (Perthshire) and later the Lake District. She developed a love for the area and for the countryside, well reflected in her best known works. She studied art privately and took exams, although preferred to develop her own style and favoured watercolours. She did illustrations of animals, insects, fossils and fungi, and one of her articles on fungi reproduction was presented to the Royal Society, but due to being an amateur (and also a woman) her findings were ignored. She had some success illustrating cards, and after encouragement she published privately the illustrated The Tale of Peter Rabbit (1901) that was published by Frederick Warne & Co a year later as a small three-colour illustrated book. She became engaged (unofficially, as her parents disapproved) to Norman Warne, her editor, in 1905, but he died suddenly of leukemia. 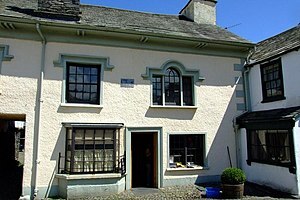 Despite this loss and from the proceeds of her books and a legacy from an aunt she bought Hill Top Farm in Near Sawrey, a small village in the Lake District, near Ambleside, in the same year. Over the following decades she bought a number of farms nearby, as she had become interested in conservationism and become friendly with one of the founders of the National Trust, Canon Hardwicke Rawnsley. She continued to write and illustrate children stories for Warne & Co and as early as 1903 she made and patented a Peter Rabbit doll and followed with many other related items (you will find all kind of merchandise related to her stories and characters, from pottery, bedding, dolls…). In 1913, aged 47, she married William Heelis, a local solicitor. She became a celebrated breeder of Herdwick sheep and died on 22nd December 1943 at her home near Sawrey, aged 77, leaving most of her property to the National Trust (and that included her flock of Herdwick sheep). To her credit is the preservation of much of the land that is now the Lake District National Park. There have been a number of adaptations of her books, to songs, films, ballets, and there are also movies about her own life, like Miss Potter (2006, Dir: Chris Noonan, with Renée Zellweger and Ewan McGregor). This is the author’s page in Amazon. I suspect that due to the illustrations the books are not free on this site although some are very cheap. 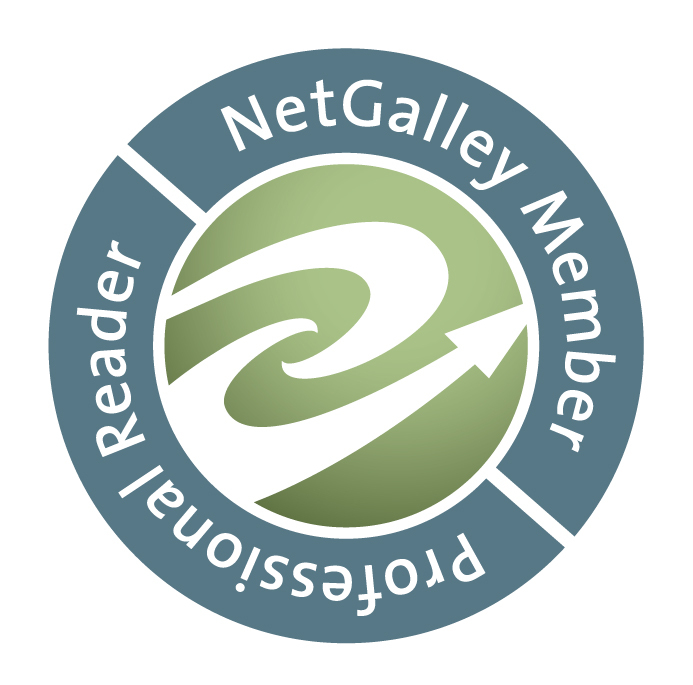 Many thanks for reading, and if you’ve enjoyed it, don’t forget to like, share, comment, and of course CLICK! And as preparation and winding down for Christmas, from next week I’ll be reviewing and reposting some of the most visited posts. Family stories. Josep and Conrado Miret Musté, Mauthausen, the French Resistance and the Spanish Civil War. As you know, my cousin Juan Molet is embarked on the task of researching and collecting information about our relatives, Josep and Conrado Miret Musté, who were exiled to France during the Civil War and ended up fighting with the French Resistance. In the past I’ve shared some of the documents that he has sent me. 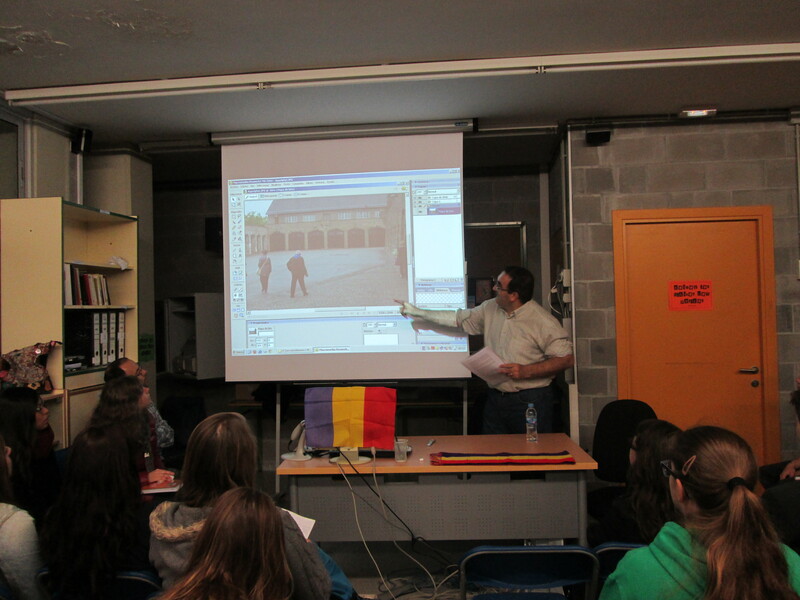 He recently sent me the document of a talk he gives to schools on the subject, and particularly about life in Mauthausen (where our great-uncle Josep Miret Musté was a prisoner during the War), and I thought it appropriate to share with you. I hope you find it informative and interesting. There are certain things that should not be forgotten. My name is Juan Molet Vila, I am a member of Amical Mauthausen and Amicale des Anciens Guerrilleros Espagnols in France ( FFI), my great-uncles were Josep Miret Musté and Conrado Miret Musté , the first died in Florisdorff , command Mauthausen on 17th November 1944 , shot by SS Hans Bühner, and the second in Paris on February 27th 1942 . First I am going to speak of Mauthausen. On August 8th 1938 the first prisoners arrived from the Dachau camp. The location was chosen because of the nearby granite quarry; firstly prisoners worked constructing the camp and then extracting stone from the quarry. The same happened in the nearby camp of Gusen in 1940. Until late 1943 Mauthausen was a camp where they brought political and ideological opponents, the conditions of the detainees were extreme and it was a camp where there was a high mortality rate . From 1943 the prisoners are also used as labor in the armaments industry and the number of prisoners increased. 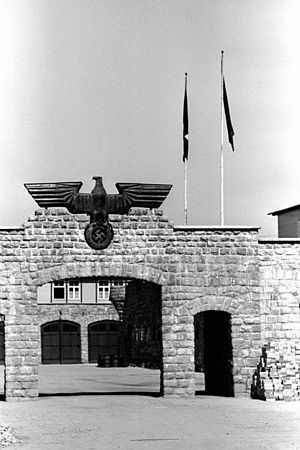 In late 1943 in Mauthausen – Gusen complex had about 14,000 prisoners and in March 1945 there were about 84000. From the second half of 1944 prisoners from other camps started coming to Mauthausen in response to the advance of Allied forces in the Second World War. This led to an overpopulation of the camp and living conditions became much harder. In the complex there were Spanish prisoners, Austrians, Germans, French, Italians, Poles, Soviets, Hungarians, Jews…In total there were prisoners of over 20 nationalities. Between the opening of the field and its release by the U.S. military it is calculated that by the field passed 200,000 deportees. Significantly, Mauthausen was not an extermination camp, it was a labour camp and most of the prisoners died because of their hard labour, because they were not fed properly for the work they did and sanitary conditions were very poor. Prisoners’ trades and skills were the main reasons determining their chances of survival. Causes of death in the camp were beatings, bullets, by injection, some froze to death, by using the gas chamber, but most died from the exploitation of their labour . In the Mauthausen – Gusen complex 100,000 prisoners died, most of them in the four months before his release on May 5th, 1945. The Nazis deported some 15,000 Spanish Republicans, of which 7,200 went to Mauthausen, 4,800 were killed and 2,400 survived. Conrado Miret Musté was born in Barcelona on April 15th 1906 and died in Paris on February 27th 1942, in Prison de la Santé. He was a member of the Popular Army of the Republic, with the rank of Major in 1938. After the victory of General Franco he was exiled in France, where he was the first Chief of the armed groups in the MOI (Immigrant Manpower), actively fighting the Germans in Paris and arrested for the first time in 1940, but he managed to escape. He was arrested again in Paris on February 12th 1942. He died after two weeks of interrogation. He was buried in a mass grave at the cemetery in Clichy (South of Paris), this mass grave was destroyed after the end of the Second World War and now his whereabouts are unknown. Recently documents certifying his death have been found in France and he has been named Honourably Dead for France in Paris on August 25, 2013. After the war he goes into exile with his wife Cecilia. During the journey, his son Josep was born. He was a prisoner in French camps until he could reach Paris. There, with his brother Conrado, he joined the French Resistance, and both were involved in acts of sabotage against the German occupation. 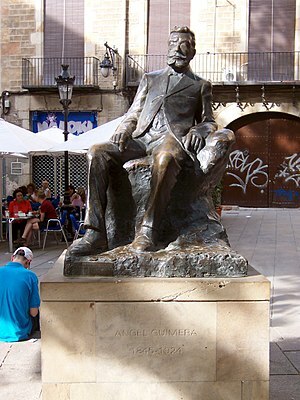 At this time his wife Cecilia and son return to Barcelona because she does not want to live through another war. He was arrested in Paris on 30th November 1942, at the apartment of his companion from the French Resistance, Lily Brumerhurst. He was transferred to Mauthausen, where he joined the underground organization of the PSUC. In the camp he finds out that Lily is pregnant and his daughter, whom he will never know, is well. This child currently resides in Australia. In the camp Josep and other comrades do active work to help the prisoners, taking pictures, and becoming involved in sabotages and escape attempts. 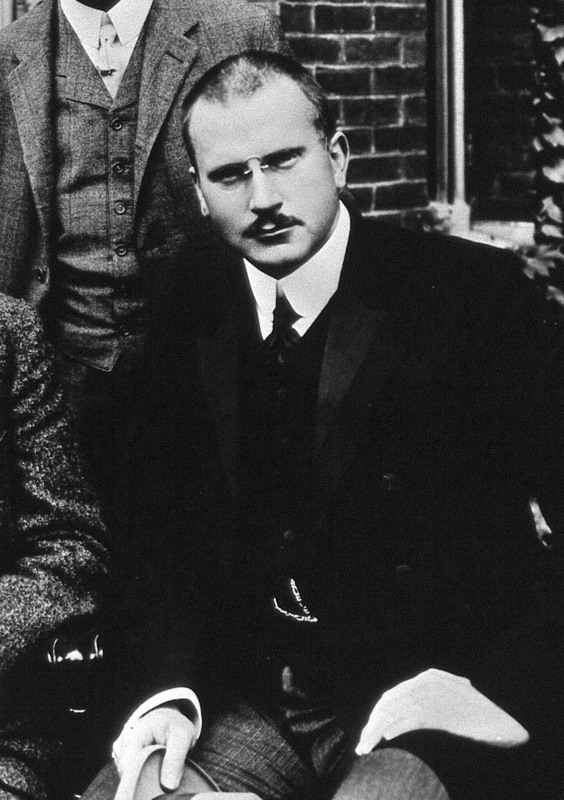 He is wounded in an allied bombing in the Florisdorf Armaments Factory where he worked, and SS Hans Bühner finishes him off with a bullet to the head. We can say that Josep and Conrado Miret Musté have begun to receive recognition by the authorities of the French Republic at the request of the Amicale of Spanish Guerilleros in France. We cannot say the same has happened in Catalonia and Spain where they remain two unknown characters, although Josep Miret Musté has received some recognition from the city of Barcelona, ​​where he has a street named after him, at the request of Amical Mauthausen. It is, of course an honour to be related to them both, and I contribute my little grain of sand in Catalonia, Spain and France to try and bring attention and recognition to these two families, as well as to all those who participated in the Spanish Civil War, went into exiled, participated in World War II and then were forgotten by the victors of the Second World War. Only France welcomed them at the time, although many of them ended locked in concentration camps in 1939, others were persecuted, and after the Second World War (1944-1945) the French authorities of the moment completely abandoned the Republican fight, and of course, they suffered the forgetfulness and contempt of the Franco government in Spain. Finally I want to say that if anyone is interested in exploring this topic in more detail, just let me know, right at the end of this act or through your Institute and I can provide more comprehensive information on the subject, thank you very much. I will continue sharing the information Juan sends me, and if you want to contact him directly I am happy to act as go between. Thanks to Juan for sharing his talk with us, and thank you all for reading, and if it was interesting, do not forget to share, to like, and comment. Historias de familia. Josep y Conrado Miret Musté, Mauthausen y la resistencia francesa. Como sabéis, mi primo Juan Molet está embarcado en la tarea de recoger información sobre unos familiares nuestros, Josep y Conrado Miret Musté, que se exiliaron a Francia durante la Guerra Civil y acabaron luchando con la resistencia francesa. He compartido en ocasiones anteriores algunos de los documentos que me ha hecho llegar. Hace poco me envió el documento de la charla que da en la escuelas sobre el tema, y particularmente sobre la vida en Mauthausen (donde estuvo internado nuestro tío-abuelo Josep Miret Musté), y me pareció apropiado compartirlo con vosotros. Espero que lo encontréis informativo e interesante. Hay ciertas cosas que no se deben olvidar. Mi nombre es Juan Molet Vila, soy miembro de Amical de Mauthausen y de Amicale des Anciens Guerrilleros Espagnols en France (FFI), mis tíos abuelos fueron Josep Miret Musté y Conrado Miret Musté, el primero fallecido en Florisdorff, comando de Mauthausen el 17 de Noviembre de 1944, por un disparo del SS Hans Bühner, y el segundo en París el el 27 de Febrero de 1942. En primer lugar os voy a hablar del campo de Mauthausen. El 8 de Agosto de 1938 llegaron los primeros prisioneros, procedentes del campo de Dachau. El lugar fue escogido por la cercana cantera de granito; en primer lugar los prisioneros trabajaron en la construcción del campo y posteriormente extrayendo piedra de la cantera, al igual que el cercano campo de Gusen en el año 1940. Hasta finales de 1943 Mauthausen era un campo adonde eran llevados opositores políticos e ideológicos, las condiciones de los detenidos eran extremas y era un campo donde había una alta tasa de mortalidad. A partir de 1943 los prisioneros también son utilizados como mano de obra en la industria de armamento y el número de presos aumenta. A finales de 1943 en el complejo Mauthausen-Gusen había unos 14000 presos y en Marzo de 1945 había unos 84000, a partir de la segunda mitad de 1944 empiezan a llegar a Mauthausen presos de otros campos ante el avance de las fuerzas aliadas en la Segunda Guerra Mundial, esto llevó a una superpoblación del campo y las condiciones de vida fueron mucho mas duras. En el complejo hubo presos españoles, austriacos, alemanes, franceses, italianos, polacos, soviéticos, húngaros, judíos… en total hubo presos de unas 20 nacionalidades. Entre la apertura del campo y la liberación por el ejército de EEUU se calcula que por el campo pasaron unos 200.000 deportados. Cabe resaltar que en un principio Mauthausen no era un campo de exterminio, era un campo de trabajo y la mayoría de los presos morían por esa causa, pues no se les alimentaba correctamente para el trabajo que realizaban y las condiciones sanitarias eran escasas o nulas. El oficio del preso era el motivo principal que determinaba sus posibilidades de supervivencia. Para acabar de hablar sobre el campo os diré que los presos morían golpeados, a balazos, mediante inyecciones, por congelación, mediante la cámara de gas, pero la mayoría murió como consecuencia de la explotación de su fuerza de trabajo. 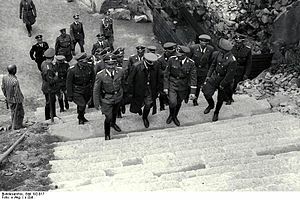 En el complejo Mauthausen-Gusen murieron unos 100.000 presos, la mayoría de ellos en los cuatro meses anteriores a su liberación, el día 5 de Mayo de 1945. El régimen nazi deportó a unos 15.000 republicanos españoles, de los cuales 7.200 fueron a parar a Mauthausen, 4.800 murieron y 2.400 pudieron sobrevivir. Conrado MiretMusté nace en Barcelona el 15 de Abril de 1906 y muere en Paris el 27 de Febrero de 1942, en la prisión de la Santé, fue miembro del Ejército Popular de la República, con el grado de Comandante en 1938, tras la victoria del General Franco se exilia en Francia, donde es el primer Jefe de los grupos armados de la M.O.I. (Mano de obra inmigrada), combate activamente a los alemanes en Paris y es arrestado una primera vez en 1940, pero logra evadirse, arrestado nuevamente en París el 12 de Febrero de 1942, muere después de dos semanas de interrogatorios. Fue enterrado en una fosa común en el cementerio de Bagneux (sur de Paris), dicha fosa común fue destruida con posterioridad al fin de la segunda guerra mundial y en la actualidad se desconoce su paradero. Recientemente se ha encontrado en Francia documentos que certifican su fallecimiento, habiendo sido nombrado Muerto por Francia y homenajeado en Paris el 25 de Agosto de 2013. Josep MiretMusté nace en Barcelona el 14 de Setiembre de 1907, estudia en l´Escola del Treball, donde se gradúa a los 18 años, aquí se forja su ideal progresista que se concreta en la lucha activa contra la Dictadura de Primo de Rivera. Durante la Segunda República ingresa en la Unió Socialista de Catalunya, pasando a dirigir las Juventudes de dicho partido. El 23 de Julio de 1936 dicho partido fue uno de los cuatro que fundó el P.S.U.C. Fue Consejero de Proveiments (Aprovisionamientos) de Guerra de la Generalitat en 1937, pero dejó el cargo para marchar al frente, como Comisario Delegado de Guerra en la Tercera División, participando en las batallas de Belchite, Mediana, Huesca y del Ebro. Al finalizar la guerra sale al exilio con su esposa Cecilia. Durante el viaje nace su hijo Josep. Está prisionero en campos franceses hasta que puede llegar a Paris, allí con su hermano Conrado entra en la Resistencia Francesa y ambos participan en actos de sabotaje contra la ocupación alemana, en este momento su esposa Cecilia y su hijo regresan a Barcelona pues ella no desea vivir otra guerra. Es detenido en Paris el 30 de Noviembre de 1942, en casa de su compañera de la Resistencia Francesa, Lily Brumerhurst, es trasladado a Mauthausen, donde se incorpora a la organización clandestina del P.S.U.C. En el campo sabe que Lily está embarazada y que la hija, a la que nunca conocerá, se encuentra bien, actualmente esta hija reside en Australia. En el campo Josep y el resto de camaradas hacen un trabajo activo de ayuda a los presos, toma de fotografías, sabotajes e intentos de fuga. Es herido en un bombardeo en Florisdorf, fábrica de armamento donde trabajaba, y rematado por el SS Hans Bühner. Cabe decir que Josep y Conrado Miret Musté han empezado a recibir reconocimiento por las autoridades de la República francesa, a petición de la antes citada Amicale de Guerrilleros Españoles en Francia. No se puede decir lo mismo en Catalunya y en España donde son dos personajes desconocidos, solamente Josep MiretMusté ha recibido el reconocimiento de la ciudad de Barcelona, donde tiene una calle, a petición de Amical de Mauthausen. 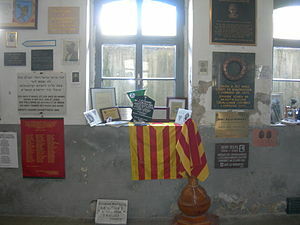 Es, por supuesto un honor para mí ser familiar suyo, y aportar mi pequeño grano de arena tanto en Catalunya, España y Francia para el recuerdo y reconocimiento de estos dos familiares, así como de todos los que participaron en la Guerra de España, tuvieron que exiliarse, participaron en la Segunda Guerra Mundial y después sufrieron el olvido por parte de los vencedores de la Segunda Guerra Mundial. Solo Francia los acogió, aunque muchos de ellos acabaron encerrados en 1939 en campos de concentración, otros fueron perseguidos y tras la Segunda Guerra Mundial (años 1944-45) las autoridades francesas del momento abandonaron por completo el combate republicano, y por supuesto, sufrieron el olvido y desprecio de las autoridades franquistas gobernantes en España. Para acabar os quiero decir que si alguien está interesado en profundizar en este tema que lo haga saber, bien al acabar este acto o a través de vuestro Instituto y le puedo facilitar información más amplia sobre el tema, muchas gracias. Yo seguiré compartiendo la información que me envía Juan, y si queréis poneros en contacto con él, también os lo puedo facilitar. Gracias a Juan por compartir su charla con nosotros, y gracias a todos vosotros por leer, y si os ha interesado, no os olvidéis de compartir, darle al me gusta, y comentar. Once again it’s Friday, and yes, guest author time. I bring you another classic today. I was debating bringing you another Romantic writer, when I suddenly thought of Kipling and I had to bring him here. Like with many of these classics his reputation has seen up and downs, both because of his style, his opinions and subject matter. As usual I’ll offer you a brief biography, one of his best known poems, ‘If’ and links to information and his works. 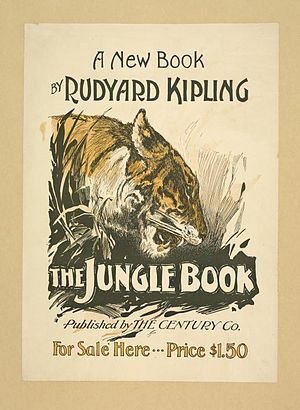 Rudyard Kipling was born in Bombay (Mumbai today) on 30th December 1865. His father was an artist and teacher (taught sculpture) and he has talked about his memories of visiting the local markets with his sister Alice. 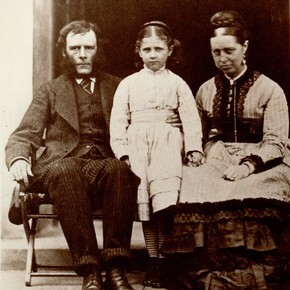 Both he and Alice were sent to the UK in 1871, to live with a foster family, the Holloways, in Southsea. It seems the mother of the family was harsh and would beat him up regularly. He took refuge in reading, and particularly enjoyed Defoe, Wilkie Collins, Emerson and Bret Harte. During the winter he would spend a month at his aunt’s, Georgie, who was married to pre-Raphaelite painter Edward Burne Jones and their children. Luckily in 1877 his mother came to England and he was sent to boarding school in Devon, where he enjoyed school and showed promise for writing. (He also got some glasses as his eye-sight was very poor). In 1882 he went back to India and worked as a journalist, also writing poetry and fiction in his spare time. He worked in the Civil and Military Gazette and later in The Pioneer. He wrote stories like ‘The Man Who Would Be King’ and ‘Gunga Din’ some of them collected in Plain Tales from the Hills that made him popular. 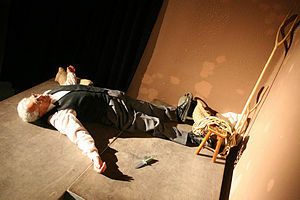 In 1889 he went to live to London. In 1892 he got married to Caroline Balestier, the sister of an American friend (and publisher. Henry James was a guest at their wedding). They travelled and settled in the US where they lived in Vermont. Their two daughters (Josephine and Elsie) were born there and he wrote The Jungle Book (1894) there too. 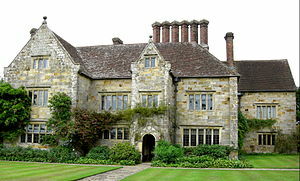 Due to disagreements with his wife’s family (it seems a legal battle with his brother-in-law) they returned to England and settled in Sussex (initially Rottingdean). His son John was born in 1897. In 1898 the family went on their first holiday to South Africa. A year later Josephine died of pneumonia (all the family suffered from it) and her death seriously affected Kipling. 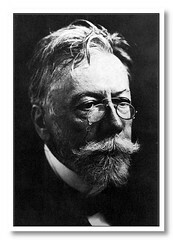 He became very involved in the Boer War efforts, visiting wounded soldiers and writing about the campaigns. Other works of the period include Stalky and Co. (1899), Kim (1901) and Puck of the Pook’s Hill (1906). He wrote The Just So Stories for his daughter Josephine (she was 6 when she died). 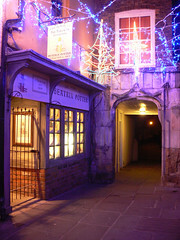 Due to his popularity and the proximity of Rottingdean to Brighton he was constantly disturbed and sought a quieter place, purchasing Bateman’s, a XVIIc. house in Burwash, East Sussex, where he lived the rest of his life. I have visited and I must say it’s a wonderful place, with a water mill and beautiful surroundings. I thoroughly recommend it. He travelled widely, including trips to South Africa in winter. In 1922 he was named Lord Rector of the University of St Andrew’s in Scotland. He was sounded for both the Knighthood and to be Poet Laureate but turned both of them down, although he accepted the Nobel Prize in 1907. He was the first author in English to obtain the prize and the youngest. He was concerned about the dangers Nazi Germany posed to England and gave an address on the subject ‘An undefended island’ to the Royal Society of St George in 1935. He died of a brain haemorrhage on 18th January 1936 and is buried in the Poet’s Corner at Westminster Abbey (near T.S. Elliot). 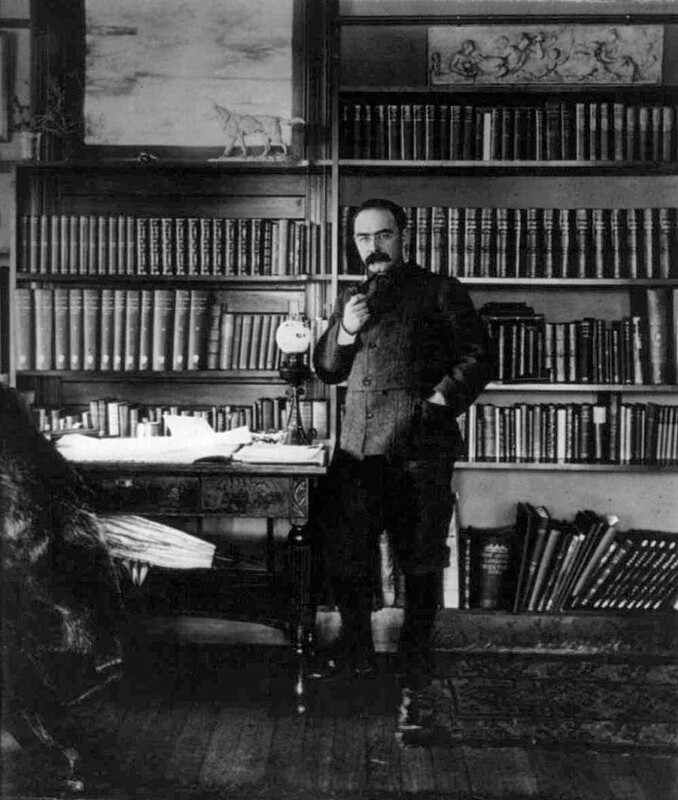 His study at the Elms, one of his houses in Rottingdean has been preserved, and as I mentioned Bateman’s is also open for visits (it is now a National Trust property). As I said there are many more. I recently finished listening to the audio of The Spirit of Ireland by Alan Cooke. I had listened (and read) Naked in New York where the author explores his adventures and experiences in New York, that I’ve reviewed in the past and again recommend. I’ve also watched his movie Home that I feel is a good companion piece of Naked and has the advantage of documenting Cooke’s personal journey whilst incorporating the views of New Yorkers old and young, famous and unknown, native and immigrants. He well deserves the Emmy for his writing in the film and I am at a loss to account for the lack of distribution for it. The author, an Irish actor, now turned writer, voice coach, and creator of audio and video sketches, returned to Ireland after his visit to the US. The Spirit of Ireland is his memoir of the process of rediscovering his country, his nation, his culture, and himself. In some ways it picks up from where Naked left, but in my opinion it goes further and deeper than the previous book. Mr Cooke combines purely autobiographical episodes (I find his remembrances of childhood scenes particularly touching) with passages where he sets his spiritual/real travels. In his trips to places known (his parents’ house, villages they used to visit when he was a child) he notes the changes experienced, the contrast between his expectations, built through years of dreaming about “home” from afar, and the sometimes stark reality. He also observes the changes inside, and how he sees and feels differently now. In his travels to new places, places that call to him, he feels at times a communion with the elements, with the spirit and soul of Ireland that he embraces fully. His descriptions of quasi-mythical animals (the horse that visits his house and seems to symbolise the untamed Celtic s spirit of the island), of primeval landscapes (that reflect the magical and ancestral power of the land), of people and faces will touch you, even if you, like me, have not a drop of Irish blood running through your veins. The author seems to tap into something that is at the same time profoundly personal but also universal, and through his voice he takes us to a place that is wondrous, exhilarating, frightening and raw. A place where we have to confront ourselves, and if we survive, we’ll finally be Home. I wonder if this is what Carl Jung was talking about when he referred to the Collective Unconscious. Having visited a tiny bit of West Ireland a few months ago I recognised some of the descriptions (loved the Isles of Aran and adored CD 4). I could also identify with some of the experiences (I remember my thoughts during my First Communion too). I gladly accompanied him on his visits and would love to meet the many characters he comes across, that always have stories to tell and help create a quilt of experiences and voices to illustrate the nature of the place and its people. The author, a bard and raconteur, is narrator, protagonist, interpreter, and performer. He has said in interviews that above all he is a performer and he can connect and communicate with people live in ways he feels is not possible by writing on the page. I feel he is too modest, although I must admit that the combination of the words with his voice and reading makes it irresistible. (And I take the opportunity to recommend some of his other audios too [A Christmas Carol, De Profundis, Oscar Wilde’s Fairy Tales…]. 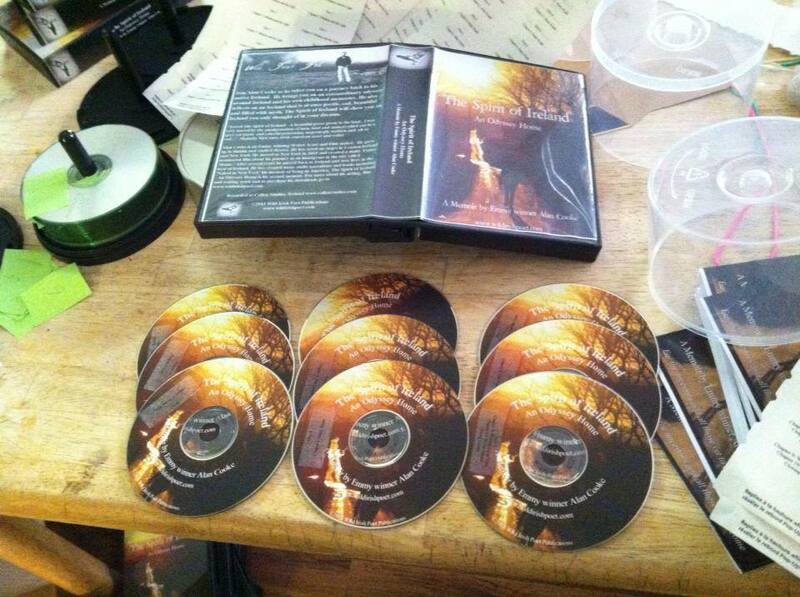 You might not want to listen to anybody else’s work after that but…). The memoir genre has become oversubscribed. Sometimes it feels as if everybody wants to write one or has written one. Don’t worry, though. This is not your standard memoir. Although the author shares very personal and even intimate experiences (the image of his mother’s reaction when she heard of the death of her own mother, the author’s grandmother, run over by a lorry will stay with me forever), it never becomes an exercise in self-indulgence. He is the consciousness of that spirit, and you won’t get any gossip or know the everyday details of life in the Burren. I leave you a link to an interesting article posted at BerkeleyUniversity on memoirs. According to Christopher Booker’s seven basic plots, The Spirit of Ireland probably falls within the plots of ‘quest’ (Odyssey being a very apt word), ‘voyage and return’ and ‘rebirth’. And if we look at William Grimes’s article: ‘We All Have A Life. Must We All Write About It?’ it would probably fall somewhere between ‘the spiritual-journey memoir’ and ‘the spirit of place memoir’. It is all of that and more. If you want to go to places you haven’t been, get in touch with your own spirituality, and connect with collective myths, whilst listening to a beautiful and engrossing voice, I recommend you the audio of The Spirit of Ireland. There you will also find links to his Facebook pages (where you can follow his posts, including samples of new work, photographs, etc. ), his e-mail address if you want to contact him, and you can also access updates on his projects. 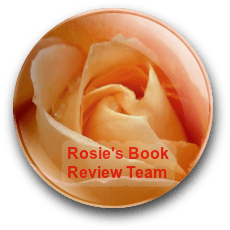 Thank you for reading and as if you’ve enjoyed it, remember to like, comment, share and of course CLICK!